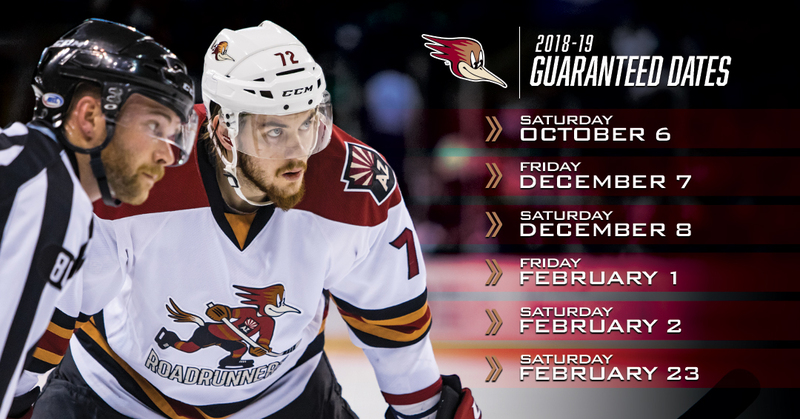 TUCSON, AZ – The Tucson Roadrunners, proud American Hockey League affiliate of the Arizona Coyotes, shared six dates today that the club will host a guaranteed home game at Tucson Arena. All start times will be announced upon reveal of the complete 2018-19 season schedule, which will be shared at a later date. For more information on Roadrunners opponents for the season, click HERE. Partial Season Plans for the upcoming season are on sale now and start at just $168. Packages include tickets to the Opening Night contest, as well as 11 games of your choice. Plans also come with the benefit of discounted parking, fan experiences, merchandise, suite rentals and more. Group options are also available today and include four seats to opening night per $100 deposit. For more information on Partial or Full Season Memberships the team’s offices at 175 W. Broadway Blvd. in Tucson or calling 866-774-6253.